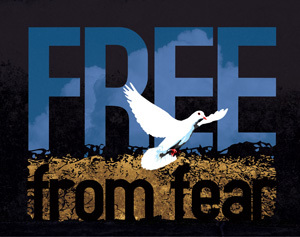 ?Politics of Fear and Religious Approach to Free from Fear? The resource persons agreed that fear is manipulated for the political purpose. Dr. Niti started by some concrete examples in Thailand particularly in the south where there are serious problems of killing, bomb blasting and burning of schools and other government properties during the past two years. He has been working for social justice for the southern Muslim minority after graduation and from time to time seen as a non-patriot or a separatist. Recently he got a letter warning against his involvement of issue of the south of Thailand. Thai people in general fear of the Muslim in the south. The southern Muslims fear of government authorities. And, government fears of separatist movement by some Muslims. Such fear leads to the violent policies to suppress the Muslim. Another example is the disappearance of Mr. Somchai Nilapaichit, a Muslim lawyer who was not seen for more than a year. Mr. Somchai fought in the court of justice for the Muslim people who were alleged to be separatists or terrorists. It triggered fear among Muslim people that, even the one who is confident in law cannot be given justice. In fact Muslims fear of sin and of doing bad. But they are allowed to react when being threatened or facing injustice. Dr. Decha who studied the suppression against ethnic minority along Thai-Burma border started his presentation with the concept of ?nation-state?. Nation is the matter of common memory of people while state is the matter of boundary and authority. To him the massacre of Muslims in Gruse Mosque, Pattani province and in Tak Bai District, Narathiwas province are similar to the killing of Karen soldiers who seized Rajburi Provincial Hospital a few years ago. That is, Thai people become restless because of the existence of ethnic and religious minority in the same country. Such restlessness originates in the arising of the idea on ?one state, one nation?. In such ideology, the memory of one dominant ethnic/religious majority (in this case, Thai and Buddhist) become solely important. The majority, then, tries to suppress, erase or conceal memory of other powerless minorities. Dr. Decha saw that the attempt to dominate creates the concept of ?the otherness?. Once the citizens feel so much restless, then their restlessness develops into fear, and with fear they allow the state to use violence against ?the other?. Therefore, not only state, but the citizens as well are part of the violence actions. In the unrest in the south of Thailand, the situation is more serious. Thai government is acting against one of the great civilizations, i.e. the Islamic civilization. In Islam, social life is not separate from spiritual life. In the south of Thailand, the Muslims are not attached to state but to religion. If the state puts much pressure on them, it is equivalent to pushing them toward the global movements that are ready to use violence. Dr. Decha saw that the restlessness is common and inevitable at individual, community and national level. It happens because the perception of life is now controlled by speed, technology and capital. The restlessness caused by modern society and lifestyle makes people feel that protection is necessary and they seek it from state. Protection comes with control, making people surrender to the authority. Then he showed several examples in the south and the northeast region of Thailand that when restlessness develops into fear, fear leads to both citizen?s upheaval and state?s use of violence reiterating fear. Therefore, the key to overcome the politics of fear is that the citizen would not allow themselves to develop restlessness into fear otherwise it will be the justification for state to use violence. He suggested that to prevent the fear, people need an open society that provides space for everyone, not only the majority. Dr. Niti added the influence of media in making and politicizing fear. Muslims become victims of media because they are portrayed as terrorists. But in fact, according to the research by Prince of Songkhla University, the Muslims are killed in larger number than the Buddhists. Ms. Wanida talked about how fear was made to hypnotize people about national security. She related her experience as working with the largest network of poor people?s organizations that many people are frightened with the issue of security. People has no participation is self determination but let themselves to be in the hand of the few powerful state authorities. When the state authorities are dominated by economics, national security is used to protect economic interest. When the poor villagers protest against the construction gas pipeline in Songkhla province that destroys their livelihood, for example, the state regards them as challenging national security. Then she raised some more examples showing that the state manipulates public fear e.g. of economic sluggishness, national insecurity, inadequate water/electricity supply, etc. so as to violate the human rights and community rights of poor people. In the past, the state feared of communism. Now without communism, it creates ?terrorism? as an enemy. Wanida saw that terrorism or rebellion is worldwide because no where in the world is without violation of rights of the marginalized people. She suggested that people cultivate more wisdom and mindfulness so that they will not fall victims of politicizing of fear. She also added that in order to overcome fear, non-violence is the key. With non-violence, wisdom and mindfulness, she can develop self-confidence that her actions for the benefit of the poor are correct even though in the time that the state tries to use violence against her people. In response to the question how to use religious teachings to counter fear and create courage, Dr. Decha supported Wanida that religion or spirituality can play a critical role in dealing with changes in modern society. With spiritual practice, people can stop developing restlessness into fear. Besides, he reminded that Buddhist teaching about being in company with spiritual friends and critical contemplation are another measures. Dr. Niti gave the Islamic perspective that, when feeling fear, the Muslims who stand for justice will remember that the life and death is in the hand of God. Those who use violence, will later suffer from the even more violence used by the other. Muslims must practice patience but not hopeless because suffering is given by God. Instead they must struggle with wisdom. Wanida observed that, now is a time of religion?s resurgence to fight against immoral social, economic and political system. Religion can humanize people. From her own long-time practice of Buddhism, Buddhist principles of impermanence, sufferings, non-self are valuable, helping her to work for the welfare of people with less negative feeling. The issue of fear and security become essence-less. And the law of karma, saying that one will get the outcome of what one did, is also helpful to free her and her people from fear and become strong. After the presentation, the participants had a chance to share their ideas, mostly related to the situation of unrest in the south and the on-going peaceful protest against the current government?s measures that create fear in economic and political collapse.